Museum Tel Aviv - Exhibition Catalogue. 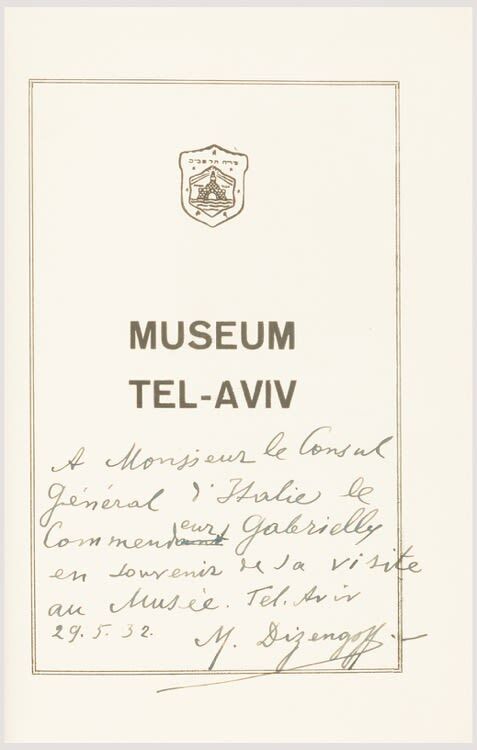 inscribed and signed in French by Mayor Meir Dizengoff to Italian Consul General Luigi Gabrielli, with the latter’s book-plate and signature. pp. 24, 23 + 4 illustrated plates. Original printed wrappers. 8vo. (Tel Aviv): Shoshany’s Press, c. 1932. The Tel Aviv Museum of Art has grown to become one of Israel`s leading artistic and cultural institutions. It was envisioned and founded in 1932 by the first Mayor of Tel Aviv, Meir Dizengoff, in his private home on Rothschild Boulevard, originally comprising only a few dozen items.